One in five teenagers have depression at some point. Your teen may be depressed if they are feeling sad, blue, unhappy, or down in the dumps. Depression is a serious problem, even more so if these feelings have taken over your teen's life. Mood disorders run in your family. They experience a stressful life event like a death in the family, divorcing parents, bullying, a break up with a boyfriend or girlfriend, or failing in school. They have low self-esteem and are very critical of themselves. Your teen is a girl. Teen girls are twice as likely as boys to have depression. Your teen has trouble being social. Your teen has learning disabilities. Your teen has a chronic illness. There are family problems or problems with their parents. 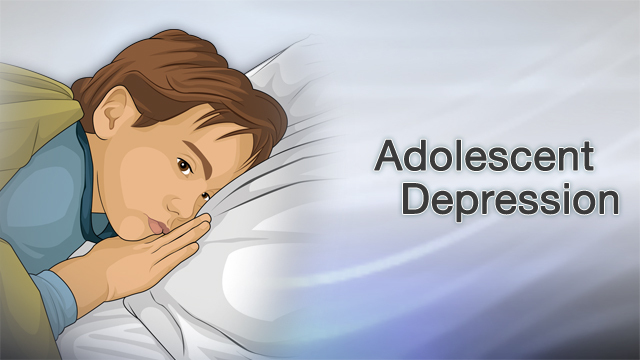 If your teen is depressed, you may see some of the following common symptoms of depression. If these symptoms last for 2 weeks or longer, talk to your teen's doctor. Frequent irritability with sudden bursts of anger. Complaints of headaches, stomach aches or other body problems. Your teen may go to the nurse's office at school a lot. Withdrawal from people like parents or some friends. Not enjoying activities they usually like. Feeling tired for much of the day. Sad or blue feelings most of the time. If you are worried that your teen is depressed, see a health care provider. The provider may perform a physical exam and order blood tests to make sure your teen does not have a medical problem. The provider may speak with other family members or your teen's teachers. These people can often help identify signs of depression in teenagers. Call your provider or a suicide hotline right away if you are worried that your teen is thinking about suicide. Never ignore a suicide threat or attempt. Call 1-800-SUICIDE or 1-800-999-9999. You can call 24/7 anywhere in the United States. Most teenagers feel down sometimes. Having support and good coping skills helps teens through down periods. Talk with your teen often. Ask them about their feelings. Talking about depression will not make the situation worse, and may help them to get help sooner. Get your teen professional help to deal with low moods. Treating depression early may help them feel better sooner, and may prevent or delay future episodes. American Psychiatric Association. Major depressive disorder. Diagnostic and Statistical Manual of Mental Disorders: DSM-5. 5th ed. Arlington, VA: American Psychiatric Publishing. 2013;160-168. Siu AL; U.S. Preventive Services Task Force. Screening for depression in children and adolescents: U.S. Preventive Services Task Force recommendation statement. Ann Intern Med. 2016;164(5):360-366. PMID: 26858097 www.ncbi.nlm.nih.gov/pubmed/26858097.